LED Utility Light features four 3-Watt high output LEDs, yet draws minimal power from the vehicle's battery. This 2 in. sq. 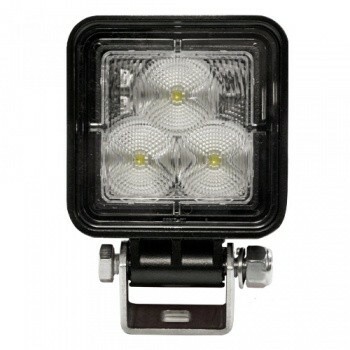 work light has a flood beam pattern which gives you a wide pattern of light in a general area close to your vehicle. Constructed with die-cast aluminum black housing this light easily resists corrosion. The lens has been engineered with a high-strength, impact resistant polycarbonate material and provides a maintenance free light that will last in any weather condition. The IP-67 Quality Rating assures total protection against dust and the effects of immersion between 5 in. to 40 in. This package includes heavy-duty brackets that are designed to be secure and easy to mount. 4.7" x 4.4" x 1.7"